The Chamber represents the rapidly growing business communities of Ballston Lake, Ballston Spa, Burnt Hills, Charlton, Clifton Park, Crescent, Glenville, Halfmoon, Jonesville, Malta, Mechanicville, Rexford, Round Lake, Schylerville, Stillwater, Vischer Ferry and Waterford. Our Chamber includes over 1,052 members from a variety of industries throughout the Tech Valley/New York Capital Region. We encourage you to explore our site or contact our office for referrals to quality local businesses, information on our region, and assistance in creating success for you and your business. Barbara Ann Heegan (Left), President and CEO of the Otsego Chamber of Commerce. 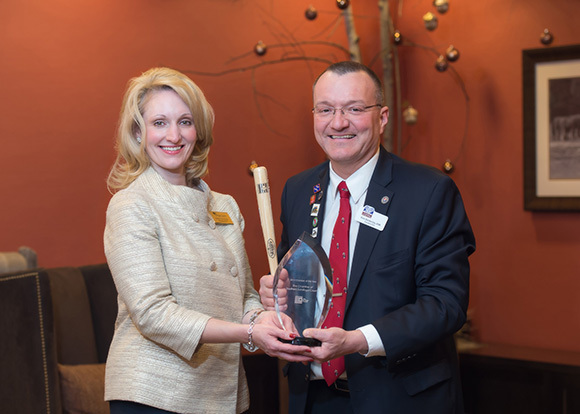 The Chamber of Southern Saratoga County is the winner of the Business Council of New York State’s Chamber of the Year award for 2014. This award, presented at the Business Council’s 2014 annual meeting in September, honors an outstanding Chamber of Commerce and its leadership team. “We are really proud to be longtime supporters of the Business Council of New York and very humbled by this prestigious award,” said Pete Bardunias, president and CEO of the Chamber of Southern Saratoga County. “We worked very hard to become leaders in marine, agriculture, manufacturing, retail, hospitality and community/microeconomic development and are thrilled that these efforts are being recognized.” He added, “None of this would have been possible without our dedicated staff, a strong and supportive board, and every single one of our members, partners and sponsors. Read the remainder of this article published in the Saratoga Business Journal.